The bond shared between the Captain and Coach is a special one well respected within the Club's four walls. For Dayne Zorko, it's a relationship he has valued highly since taking the leadership reigns from Dayne Beams earlier this season. "My relationship with Fages has become very good, it's very open and honest which I think is how it should be," Zorko said. "He's certainly the first person I bounce ideas off." 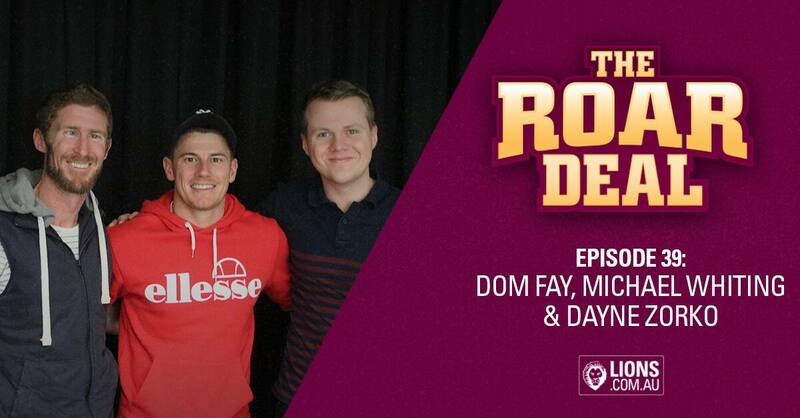 In his debut appearances on the Roar Deal podcast, Zorko (@48:53) shared with hosts Michael Whiting and Dom Fay the biggest challenges and rewards he's experienced since taking on the captaincy role. While the Lions skipper doesn't believe the way he holds himself off-field has changed, he says he no longer places as much focus on his individual performance on the field. "The biggest challenge has probably been going from worrying solely on my performance towards worrying about how we can bring other young players into the game." "It's not about me getting the touches now, it's about leading the team as best that I can. "Just onfield you certainly do worry about a lot more things like getting players involved." In seven years at the Club, Zorko has not yet tasted finals footy, but says the team doesn't feel too far away from a rise towards the top eight. "On the back of this year, I think the team will take a lot of confidence that in a few years we could be there,"
When asked by Whiting and Fay about who in the team has impressed him the most since he took on his new role, Hugh McCluggage was the skipper's answer. "Hugh McCluggage has come back this year with a sense of 'I can do it'." "The improvements and confidence he got out of last year and playing against older bodies just held him in such good stead for the pre-season which has translated on to the field." Tom Cutler and Dan McStay were the two other players that Zorko mentioned. Both 23-year-olds have shown exponential growth following the pre-season with McStay spending more time in the forward line than previous years. Also on the Roar Deal, one of the Club's longest serving employees, Marie Short (@38:05), reflected upon some of her fondest memories over the past 25 years. Short was a member of the Brisbane Bears since as long as she could remember and became very involved with the Australian Junior Football League before joining the Lions. She reflected upon the hectic hours she and fellow employees put into what was the golden era for the Brisbane Lions. At the time, her role included anything from ticketing, membership and administration to media. "We were working about 90 hours a week," Short said. "We had none of the technology that we have today, but it was all so very worth it."